Ultimate Bet is an exciting online poker site that is licensed by the Kahnawake Gaming Commission. In 1999, Ultimate Bet began dealing on the Internet and therefore has over a decade of experience to offer its customers. This is an attractive site, colored in black and yellow, that offers a range of exciting entertainment. Ultimate Bet features free poker, low stake tables, jackpot action and exciting tournament play. This site is available to gamers from around the world including U.S. players. The Ultimate Bet site is accessible in English, Spanish, German, French and Swedish for the convenience of players located in different places around the globe. This site is user friendly and it is simple to find one’s way around. Free poker is available at this fun online poker gaming site. Such games can be enjoyed for pure entertainment or even as a practice tool. Once a player has had enough or has gained sufficient knowledge and confidence to play for real, the real money tables are available for action. In addition to the free games, players may also make use of instructions of how to play the games and various strategies that are featured at the site. 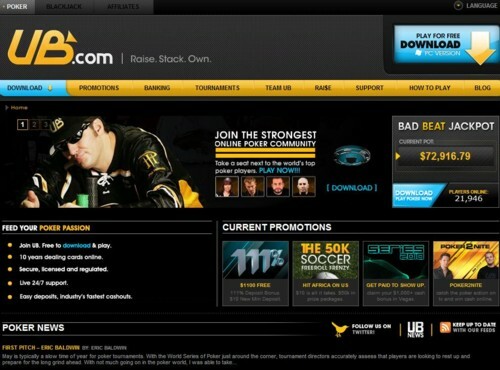 This online poker site offers an appealing bad beat jackpot the current amount of which is quoted on the homepage. Ultimate Bet hosts Team UB that is a collection of professional poker players that are more than just ambassadors for UB – they also play Ultimate Bet online poker. Promotions are an attractive feature at any online gaming site and Ultimate Bet is no different in this matter and presents a whole range of special promotions. Ultimate Bet offers its new players a welcoming sign up bonus of 111%. Players may benefit from this bonus up to the amount of $1100 upon a first deposit at the site. The thrilling entertainment at this online poker site includes actions such as the Poker2Nite TV show, leader boards, challenges and Power Sunday where players may earn double points. Ultimate Bet presents an attractive range of exciting poker entertainment that includes Texas Hold’em, Omaha, Omaha 8 / better, Stud and stud 8 / better, RAZZ and HORSE. In addition, players at this site may try their hand at games of blackjack and elimination blackjack. Ultimate Bet also offers exciting tournament action that ranges from freerolls to tournaments with high buy-ins. This means that there should be something to suit every poker enthusiast. Ultimate Bet utilizes 128 bit SSL encryption as a protective measure for information at the site. Ultimate Bet also sports the iTech Labs certified logo as a symbol of the randomness and fairness of the random number generator incorporated in the software. Ultimate Bet hosts a useful frequently asked questions section that covers various topics, in order to provide assistance for its clients. Should this page not answer a player’s particular query, then gamers may make use of a 24 hour live customer support service.